Buying the perfect gift doesn’t have to be an acrobatic feat! Cirque du Soleil gift cards are easy to purchase, simple to use and incredibly flexible. Head online to make your purchase, then present your loved ones with an exclusive gift that’s sure to make their hearts soar. They can select one of the exciting shows here at home or any of Cirque du Soleil’s stunning performances anywhere in the U.S. and Canada, from the new big top show VOLTA to LUZIA, CRYSTAL, KÀ, “O,” and many more. Plus the funds never expire! 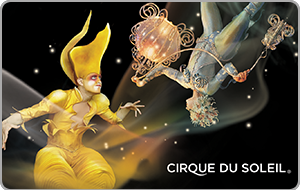 Redeemable up to balance online or at any participating Cirque du Soleil® point of sale to purchase tickets to Cirque du Soleil shows presented in USA or Canada. Unless otherwise specified, not redeemable for merchandise, food and beverage. All purchases made with this card are subject to the applicable Cirque du Soleil’s refund and exchange policy and the amount of any refunds will be placed back on card. Not redeemable for cash except where required by law. Not reloadable. Not a credit or debit card. Card value is in US currency. Unless your card has been registered, your card will not be replaced if lost, stolen or damaged. Cirque du Soleil Canada Inc. is the card issuer and sole obligor to card owner. Issuer may delegate its duties or assign its rights and obligations without recourse. Purchase or use of this card constitutes acceptance of these terms and conditions and the Cardholder Agreement, including terms regarding dispute resolution. For a replacement card, copy of the Cardholder Agreement, to activate and/or register your card, to learn where to redeem your card, and for balance inquiries or other information, please visit cirquedusoleil.com/gift-cards or call us toll-free at 1-877-924-7783. FUNDS DO NOT EXPIRE. Notwithstanding the card expiration date indicated, this card expires 5 years after its activation. Call for a replacement card.